Two Simultaneous Milestones. Is There a Relationship? 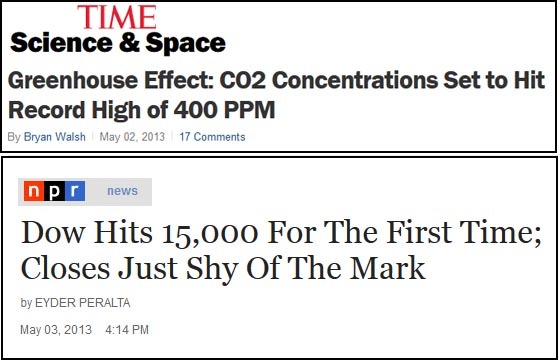 What does it mean that the Dow Jones is surpassing 15,000 at the same time that carbon dioxide in the atmosphere is set to break 400 parts per million? Not much really. There isn’t exactly a direct tie between the two. But there is a rough correlation between the expansion of a consumer economy, which generally signals economic growth and a rising stock market, and the continuing increase in carbon dioxide and other greenhouse gases. Of course, there are major differences, too. For one, the stock market, while tending to grow inexorably over the long term, is volatile and can experience drops, sometimes huge ones. But it has always recovered and then exceeded past levels. The level of carbon dioxide in the atmosphere has had ups and downs as well, but over a much, much longer geological time. The current level of carbon dioxide is the highest the Earth has seen in millions of years (I’ve seen numbers ranging from 650,000 years to 15 million) and, obviously, the highest ever in human history. The level now is about 33% higher than it was at the beginning of the industrial revolution. The stock market, by comparison, has been around for barely a moment. If we compare the market level trend and carbon dioxide levels over the time period that the market has existed, we see a pretty close correlation. This doesn’t, of course, mean the stock market is responsible for greenhouse gases and climate disruption. But we can view the market as a proxy indicator for the industrial revolution and growth of worldwide GDP. From there, it’s a reasonable jump to acknowledge that the industrial revolution and the growth of manufacturing have a direct relationship to the burning of fossil fuels and the release of long buried carbon dioxide into the atmosphere. It doesn’t have to be this way, and that’s one of the major points of EcoOptimism as well as the writings of many others. Economic growth does not have to be dependent on burning fossil fuels and, furthermore, economic growth is not a good indicator of human growth. But for the moment, we are embedded in a system that promotes making more and more stuff, regardless of whether we actually benefit from the stuff (check out my Wrongest Product Award nominations for examples of this). And that system is further tied to carbon-based energy. As long as this remains the case, the stock market and greenhouse gases will continue to rise roughly in parallel. There are two very fundamental solutions to this. One is that we need to stop gauging economic health by GDP and the price of corporate stocks, especially since they are very poor indicators of human progress. The other, of course, is that we need to stop creating energy from carbon sources and switch to renewables. Then we can decouple human happiness from human self-destruction. This entry was posted in Economics and tagged GDP on May 7, 2013 by David Bergman.